Composite reels with ABS flanges and steel barrel, suitable for the winding of telephone cables, insulated cables and fiber optics. They are commonly used in extrusion lines at high speed and are assembled with screwed rods and self locking nuts. 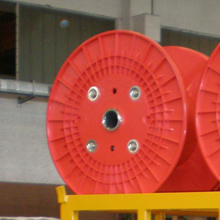 They are provided with machined bushings and painted or galvanized barrel.